The grounds of St. Joseph’s Academy in Baton Rouge were quiet as a summer sun shone brightly on the school’s newest addition, a 23,150-square-foot Student Activity Center. 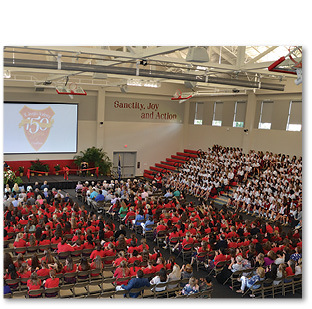 But inside the facility, there was a hubbub of activity as students filled the bleachers and faculty and staff greeted alumnae and visitors for a ribbon-cutting ceremony and special blessing of the new building that kicked off the school’s year-long 150th Anniversary Celebration. The planning stages of the $6.7 million activity center began four years ago following a study revealing the former activity center was not large enough to accommodate the school’s 1,110 students, let alone any parents, at a single gathering. The new student activity center also includes a training facility and workout rooms with state-of-the-art equipment. But, it’s the ability to bring everyone together, under one roof, that has generated the most excitement. SJA athletics director Dorinda Beaumont said the building is not just for athletes but the entire SJA community. 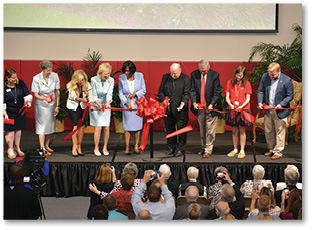 Bishop Robert W. Muench joins Baton Rouge Mayor Sharon Weston Broom and St. Joseph’s Academy faculty and alumnae to cut the ribbon at SJA’s new Student Activity Center. The ceremony was held on the first day of school Aug. 8 and kicked of a year of events celebrating the school’s 150th anniversary. “This new facility is fabulous and just to celebrate our history with the sisters and what they’ve done and going back to them, relating what their mission was and always keeping the mission here … it’s going to be an exciting year,” said assistant athletic director Nan Murtagh, who has worked at the school for 35 years, including 25 as coach of the swim team. The ceremony included a parade of students representing the different groups that will be using the activity center. Last in the line-up were two students hoisting the giant trophy from the 2018 National High School Championship, won by SJA cheerleaders in February in Orlando, Florida. “None of us anticipated for this senior year to be so special, but we’re glad it is,” said Grace Wisdom. In his remarks, Bishop Muench noted the amount of people, time, effort and money invested in the new facility but also mentioned there was a deeper meaning to that investment. 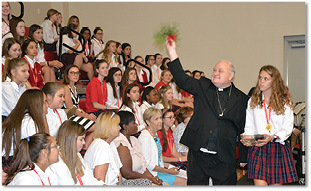 After blessing the activity center with holy water, Bishop Muench was presented with a lifetime pass to all SJA home volleyball and basketball games and an SJA spirit shirt, which prompted the bishop to quickly remove his jacket and put it on, to the wild cheers and applause of the audience. Adler said she was pleased to see the turnout and excitement generated from two years of planning. She noted that an early morning balloon release by the senior class served as a reminder of her’s and others’ strong connection to the school. The 23,150-square-foot Student Activity Center includes a workout room and will be used for sporting events as well as school events, including Mass. Sister Joan LaPlace CSJ, associate director of mission, has been with SJA since 1964 and credits that mission with helping the school to successfully navigate through challenging times. And, still the school thrived, growing and outgrowing classrooms, facilities and buildings. For more information on the year-long celebration, visit St. Joseph’s Academy website at sjabr.org.